The thickness of the 16mm hardened steel is widened and stronger. The outer layer is coated with silica gel, which is comfortable and has a certain protective effect on the lock. The spiral design of 12mm x1.2m cable can effectively avoid all kinds of physical attacks. The outer PVC protects your hands at the same time to avoid being damaged by cables. The packing is equipped with mounting bracket. The bracket is screwed on the bicycle so that the U lock can be buckled on the bracket and taken away at any time. In order to prevent the risk that the key is lost so that the U-lock can not be unraveled, there are 3 keys in the package. One to carry with each other, and the other to be placed at home. The lock beam of the U lock is hardened by heat treatment and can resist 12 tons of hydraulic shear. Therefore, the safety factor becomes higher and your bike is effectively protected. The lock core is made of C grade pure copper blades, which can be professional anti-theft. The change of key teeth is very complex, which can effectively reduce the interlock rate and prevent thieves from opening. The outer part of the steel cable is made of environmentally-friendly PVC adhesive, so it is non-toxic and tasteless. 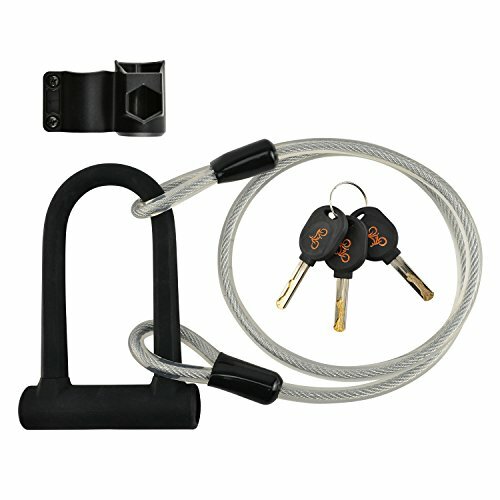 It can be used together with the U lock to lock the bicycle frame. The exterior of the lock body and the lock beam is also made of environmentally-friendly silica gel. The handle is comfortable and does not cause harmful substances to the human body. If you have any questions about this product by MokenEye, contact us by completing and submitting the form below. If you are looking for a specif part number, please include it with your message.